Many of you are asking what is the difference between the free Silhouette Studio and Designer Edition, etc. and I was surprised to find a lot of incomplete and inaccurate information on the topic so I decided to post my own list. This is my personal, unofficial list … in other words, the real lowdown including some little known secrets. -You don’t have to have a Silhouette machine to download the basic software and enjoy what is one of the best free page design programs out there. I recommend getting version 3.6.057 from this page. -Everyone who has a Cameo, but not a Curio should at least download (if not install yet) version 4.0.837 to be able to access the Curio functions. -Any upgrade you buy is good for up to 3 computers at a time. Upgrading is as simple as entering a 16 digit code and you will not lose any of your designs or have to learn a new interface. -Almost every Silhouette owner can benefit from Designer Edition. It will quickly pay for itself in free SVGs alone and make your Silhouette life smoother. 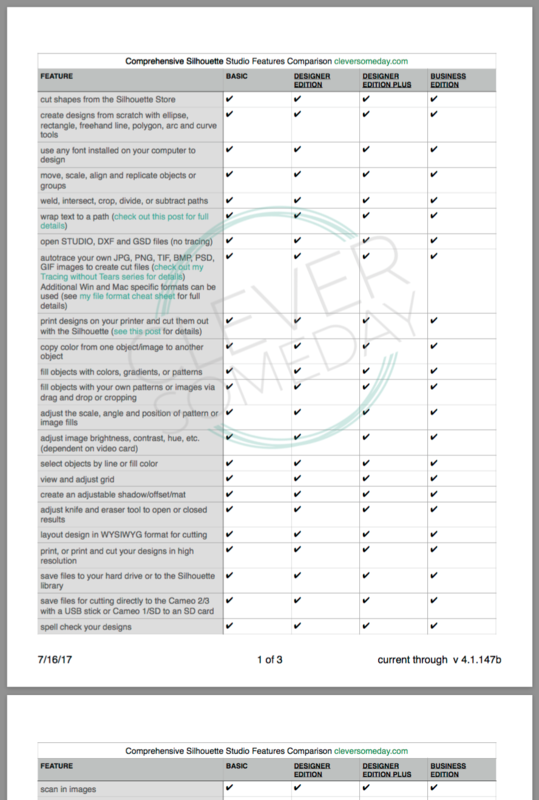 -Designer Plus is good for embroidery enthusiasts; and rhinestoners not interested in 3rd party rhinestone software (once 4.1 comes out of beta, will be useful for tumbler makers). -Business Edition is good if you have more than one machine or if you do a lot of oversized designs (once 4.1 comes out out beta, will be critical for designers, because of the save as SVG feature). -Whatever you do, don’t pay full price. The (affiliate) links in this post will take you to SVG Tools which offers among the best prices and perks and will get you upgraded in 24 hours (usually much quicker). -You can upgrade in steps from any version at any time, so you don’t have to make a final decision at the start. See all the options here. As always Kay, great information in a clear, concise format! Thank you so much. I am still in V2 land with DE. I know I must make the leap soon but was never sure what version to land on. Your post will help a great deal. Thanks again and have a happy, healthy new year! Any file can be a sketch file, but DE lets you stylize the sketch outlines and fills. Unfortunately it can’t quite fill text adequately as is as I show here How to Fill Fonts for Sketching in SSDE The Curio fills do not require this workaround. Thanks for some great info, Kay. I really enjoy your tutorials! The link to svgtools where we can get better prices on Designer Edition software did not work. Can you give us a better link? Thanks so much. Thanks for letting me know! Links are fixed. A friend gave me a very old Silhouette and I’m wondering if it’s capable of doing all these things if I download the software. It’s 8.5 x 11 format and it says Silhouette 1. I have no documentation or instructions of any kind, and she doesn’t remember anything about it. I’ve been using a Cricut Explore for about a year, and took the old Silhouette in hopes it would be easier to accurately cut stamped images (I’m primarily a paper crafter). Do you know if the Pic Scan mat would work? And if the DE software would still run on it? Thanks so much for any help you might be able to provide! I love all the info you share… it’s been a great help to me! You can run the current software on the original Silhouette. I recommend 3.6.057. The Pixscan mat will not work, however, because the older machines use slightly different registration marks. I do have a technique for cutting stamped images without PixScan here. http://cleversomeday.com/stamp-and-cut-with-silhouette-studio-reg-mark-method/ Also if you have an iOS device try the SnapMat feature with your Cricut. Kay thank you for your efforts to make life easier and better for all of us. I enjoyed the article and will definitely upgrade from Designer. I am even thinking about the Curio. If you had to pay for it, what would you get? Also a good machine that you run plates through to cut designs…..do you have any experience with those? New Years blessings to everyone! Thanks so much! I’ll give it a try. Any tips for using SnapMat? I’ve tried everything… dark background, putting my device on a table, etc. and can NOT get it to take a picture for the life of me. Thought you would want to know. I will maneuver over to my laptop and try there. I do want to know, so thank you! I fixed them a bit ago and they check out on my phone now. Sorry for the inconvenience. Kay, thank you for all your information!!! I just love the fact that if you know it or find it out, you share it!!! I appreciate that so much! Thanks again, and Happy New Year!!!! Thank you for this information. Hope you have a wonderful new year. 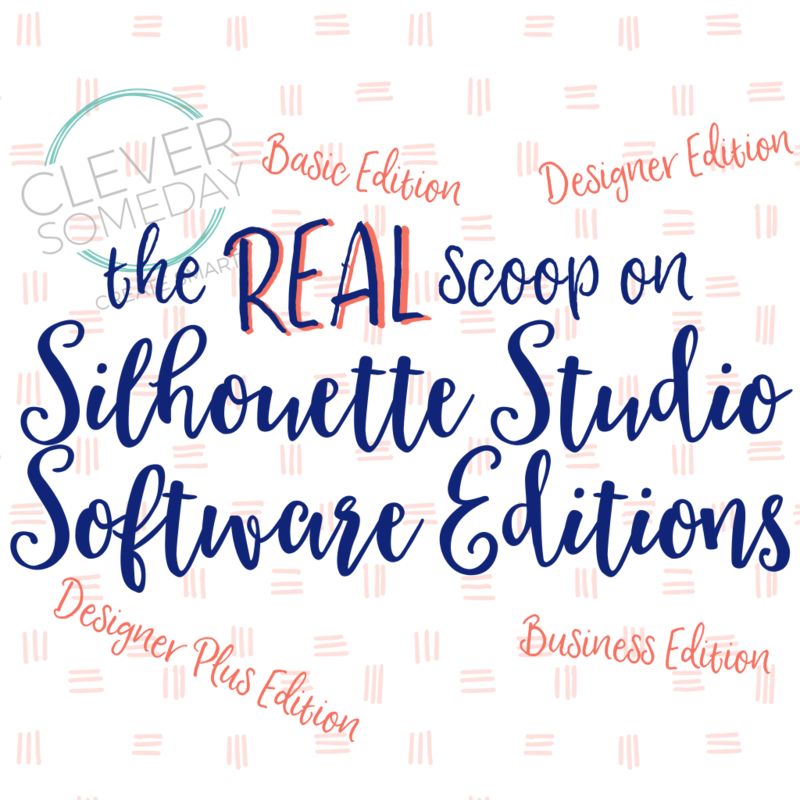 The links for “Silhouette Studio Designer Edition”, “Silhouette Studio Designer Plus Edition”, Silhouette STudio Business Edition”, “SVG Tools”, and “See all the options here” – give you a Page cannot be found message. Thanks, Carol. I fixed this early yesterday and the links are checking out fine for me on desktop and mobile. Not sure what else I can do but suggest you refresh the blog post page. I do appreciate you letting me know. Great article Kay. I would like to add the on the upgrades if you buy the Business Edition (BE) it includes all previous DE upgrades and DE Plus that was released after the Business Edition. So if you are wanting DE Plus and bought BE 1st you already have it. Yes, as I mention, each version contains all of the above features for each version going down the list. Thank you for much needed information! The cloud is not stable yet, so I’m not recommending using it at this time as your only means of backup. The best method is till to save the individual .studio files to your backup media (SD Card, etc) Do not use the Save to SD card option, however, because the resulting format can not be read by Silhouette Studio. Hello Kay. I LOVE your tutorials and look forward to them. I have two questions. I recently upgraded from the DE to the Business Edition largely due to your article =) . I am running Version 3.6.89 of Silhouette on a PC. Is there a better version of Silhouette I need to run prior to doing the update? I saw your reference above to version 3.6.057. Second question. How do I subscribe to get updates on all of your posts in WordPress? Right now I only get updates on this post. I also stalk, oops! follow you on You Tube! lol Thank you for all you do to help us. Thanks for the kind words, Jerri! You should be fine with the version you have to upgrade to BE. I have some repairs to do on the web site to restore the subscription function. In the meantime you can follow me on bloglovin. I just got Designer Edition Plus because I wanted to open SVG files, BUT now I find that I can not also save SVG files. I just watched your youtube video on Saving a Printable from Silhouette Studio where you suggested to download PDF Creator version 1.7.3, but this is no longer available. 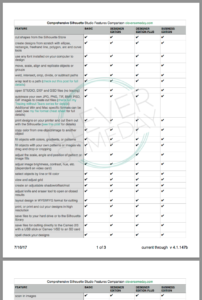 Will one of the newer versions of PDF Creator work to save an SVG file? PDF Creator, while very useful from other programs and web apps, could never create a usable SVG from Silhouette Studio because of the way Silhouette Studio outputs print data. There is a studio to svg file converter you can google. I would also appreciate it if you would let support at both Silhouette and pdfforge (PDF Creator) know that you would like to see save as SVG capability added/restored. You make things so clear for the rest of us! Thank you, Kay! Thanks, Andrea, that’s what I’m going for.